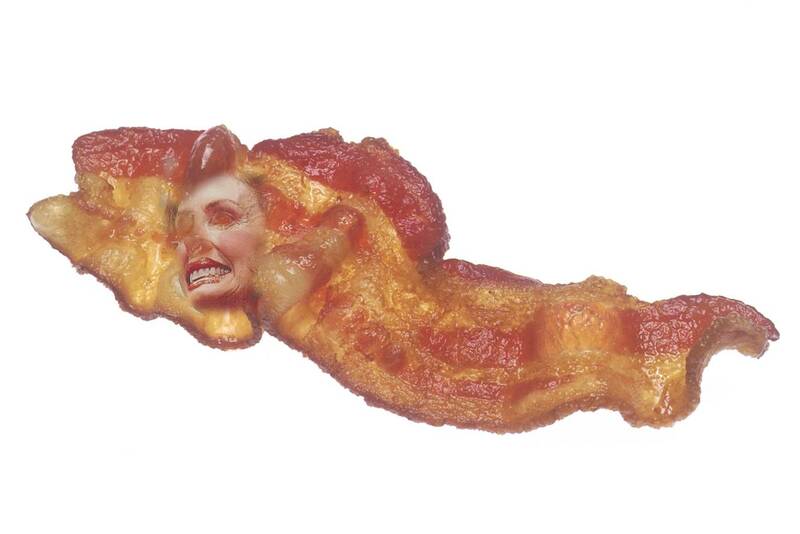 <<BREAKING NEWS>> Head Muscle Press 27 Jan 2011 – When Mr. Ellis Pollard of Mallard Wisconsin received his Sunrise Special at the Waffle Shop this past Saturday morning, he was startled to find that one of his bacon strips bore the uncanny likeness of Nancy Pelosi (see image below). According to reports, Pollard spent the next few hours studying the image under a magnifying glass to ensure that what he was actually seeing was not a trick of the light. When convinced that the image of Pelosi was real, he took the strip of bacon to a local television station and reported his miraculous finding. “At first the reporters were skeptical when I told them what I had found, but when I unwrapped the bacon and showed them they were awestruck,” Pollard recounted. According to Mr. Pollard, over the next couple of days people gazing at the piece of Pelosi pork started to experience miracles. One unemployed lady allegedly saw the image and, upon returning home, discovered that her unemployment benefits had been extended a fourth time. In another account, a committed Tea Partier looked at the image and immediately fell to the ground shouting anti-Palin slogans. The most noteworthy instance occurred when an older gentleman saw the image and started channeling Ted Kennedy. 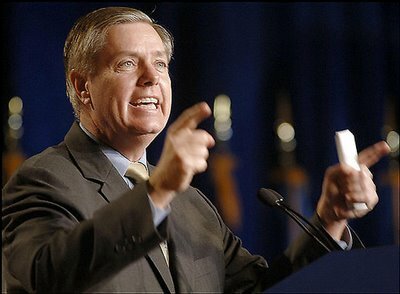 For over 30 minutes he extolled the virtues of the healthcare bill, drank Scotch Whiskey, and blamed the Republicans for setting him up at Chappaquiddick. 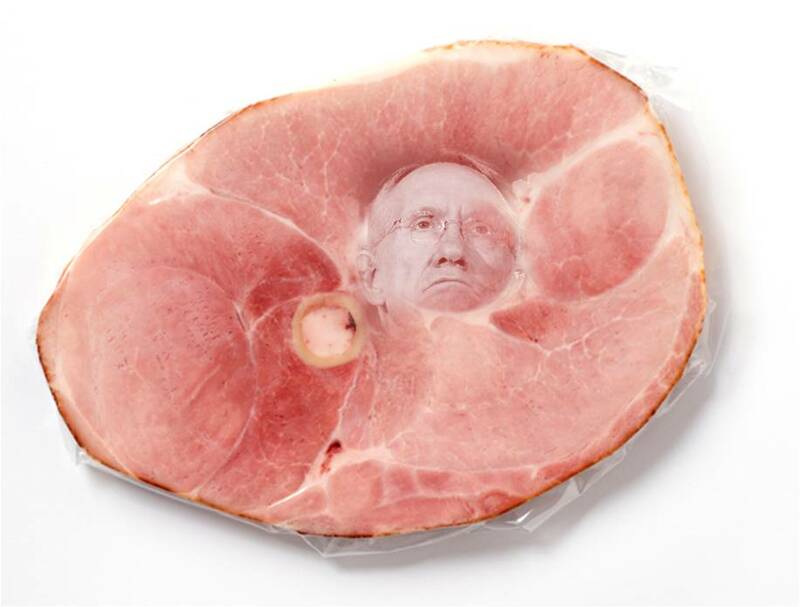 Though the DNC has withheld official comment, it is a well known fact around the DC area that this is not the first time images of Democrats have spontaneously appeared on pieces of fatty pork. 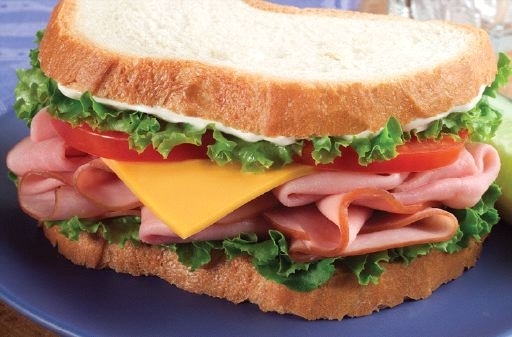 In 2006 Martin Emmitt of Shellsburg Idaho produced the now famous “Harry Ham” slice (below), which was purported to make anyone who looked at it pro-labor. 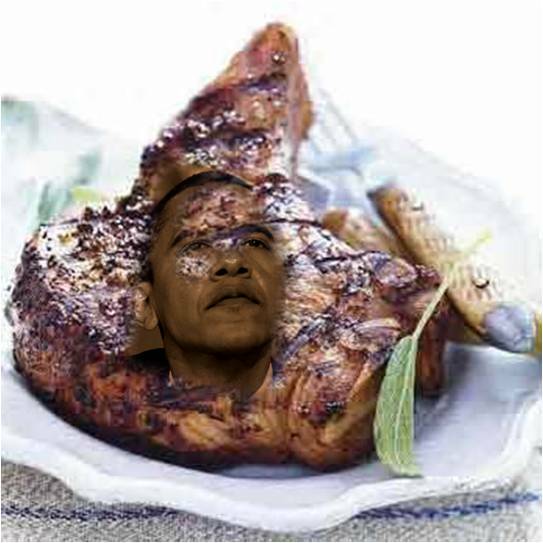 And then more recently during the 2008 presidential campaign, hundreds of mysterious Obama Chops appeared in diners across key swing states that eventually went blue. “It is kind of like the whole UFO thing,” Cameron Dalton author of the self-published book ‘Conspiracy of Pork’ confided to Head Muscle. “No one wants to admit that this is happening, but you just cannot deny the evidence when it is right there on your sausage patty.” Mr. Dalton is the founder of Conservative Republicans Against Pork Propaganda (CRAPP) and is trying to lift the veil on what he describes as a massive liberal plot to control voters through use of pork stimulation. “The problem is pervasive,” Dalton warns. “No one really knows how much pork the Democrats actually control. Why there could be thousands of unsuspecting people swallowing this garbage as we speak!” Though CRAPP is small right now, it is gaining a foothold among independents and conservative vegetarians. According to Dalton, liberals plan to flood the American people with more and more pork over the next two years until everyone is hopelessly hooked. In an ominous warning, Dalton pointed out to Head Muscle that the Pelosi image will soon be followed by the most massive DNC pork project to date…Operation Barney Frank. According to Dalton they have already appeared at the Fannie Mae cafeteria and will likely be passed out to homeowners through thousands of new sub-prime hot dog vendors. Head Muscle will continue to follow this breaking story as it develops. In the meantime we strongly suggest that Americans everywhere stick to the beef. Obama went on to explain that, because his administration had won the war in Iraq, there was now a vacancy on the Axis of Evil list, and that Arizona’s flagrant attempts to preserve their borders had earned them a place on the list just ahead of North Korea. After the press conference, a spokesperson for the White House noted that Obama had also contacted the Cuban chair of the UN Human Rights Council to request a statement of international condemnation for the Grand Canyon State. “We are really hoping for a strong statement from the council, and have already held private discussions with members from China, Libya, Sudan, and Cuba to urge them to act quickly,” the spokesman noted. HM: Thanks much for providing us this exclusive interview. SP: No problem. I am happy to put to rest any misconceptions that the public may have about the President’s position on immigration and the new Arizona law. HM: So, it is kind of odd to have one of our states on the Axis of Evil list. What exactly does it mean for Arizona? SP: Well it is pretty severe. First we anticipate a broad range of actions. SP: Well first of all, we are taking steps to change the name of the Grand Canyon. HM: Wow, really? What will the new name be? SP: Canyon El Grande. That should be a wake up call for all those Arizona racists. HM: Ok….well…what else are you planning on doing? SP: Well the President is also considering a package of sanctions against the state. First off, he is planning on repealing the Bush tax cuts for all Arizona citizens, raising their cost of health care, placing heavy tax burdens on Arizona small businesses, and possibly placing heavy taxes on their power consumption. It will really be brutal. SP: (Interrupting) Oh and that is just the tip of the iceberg. He is also planning a world tour to formally apologize for Arizona’s actions. HM: A world apology tour? SP: (Interrupting again) Oh he’s a master. HM: So, what will the goal be with all these actions? SP: Well regime change of course. Brewer must be arrested…I mean…defeated. HM: Who would you want for Governor in her place? SP: First off, instead of ‘governor,’ all future heads of state will be referred to as ‘El Hefe Grande.’ Obama thinks it will really help immigrants reclaim their self esteem. SP: (Impressed) Ah, your Spanish is impressive! Perhaps you could be part of the new Arizona legislature. SP: Oh yeah, we will have to have all the current lawmakers arreste….I mean…..removed from office first though. HM: Will the Arizona Legislature have a new name too? SP: You guessed it. We are calling it ‘El Junta Magnifico.’ El Guapo thought of that one himself. SP: (Chuckling) Oh…sorry….Obama. He asks us to call him that in private. SP: Well, he is pretty hot….I mean except for the ears…..don’t you think? 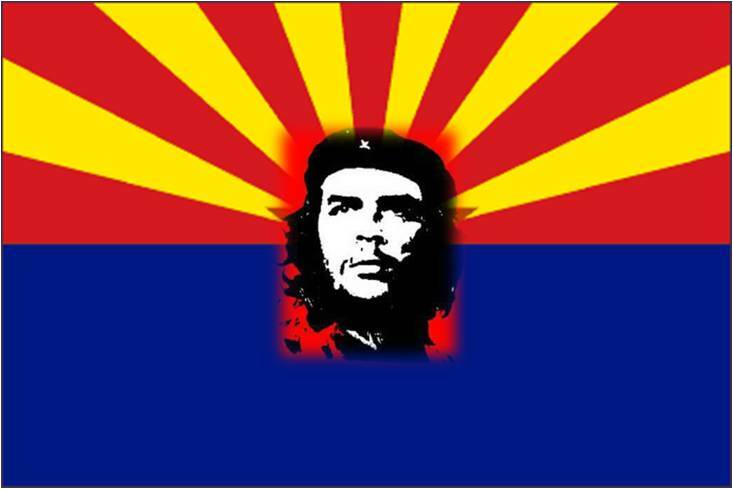 SP: We have also designed a new state flag for Arizona once the coups…I mean….the new leadership is elected. HM: A new state flag? Really? SP: Sure! Do you want to see it? I have a picture. HM: (Shocked) You replaced the star with Che Grevara’s head? SP: (Pumping fist in the air) Viva la revolucion de Arizona! HM: Wasn’t Che a Communist and a murderer? SP: Oh sure, but damn if he doesn’t look good on a t-shirt. HM: (Pausing) So is President Obama just going to let our borders stay open? SP: No…don’t be silly. In fact, in just a few weeks, he is going to announce a bold new plan to finish the border fence at half the price and reduce illegal immigration by 50%. HM: Wow, that sounds impressive, how is he going to do it? SP: (Unfolding a piece of paper) Well I just happen to have a diagram of his plan right here with me…impressive isn’t it? HM: (Looking at paper) I am not sure. It just looks like a bunch of dashed lines on the border. SP: It’s not just a dashed line. It’s Obama’s new fence! SP: (Speaking slowly) Let me explain. 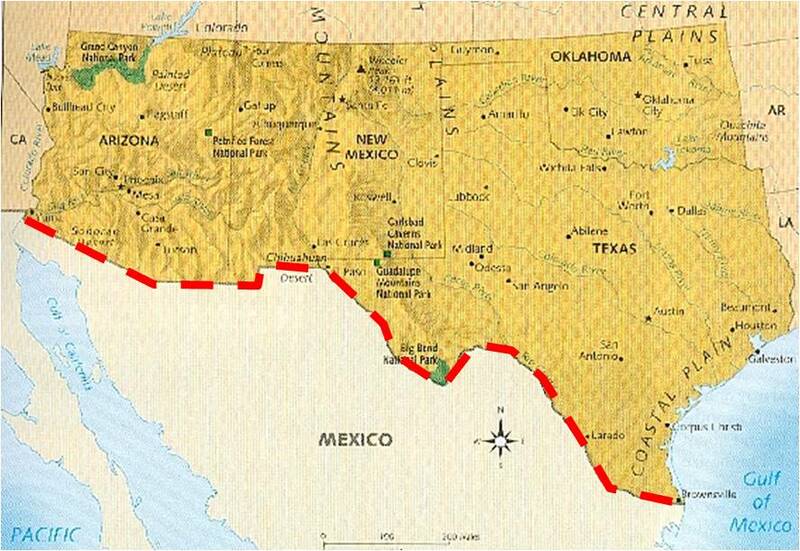 We have hundreds of miles of border with no fence, so Obama is going to fix that by rebuilding the fence like you see it here on the map. It is brilliant don’t you think? HM: You mean he is going to build a dashed line? SP: You got it! And he is going to save money by tearing out sections of the existing fence and reusing it in other places. You see Obama has calculated that there is enough existing fence to span the entire border as long as it is build like the line you see above! It will save material costs and cut illegal border crossings by half! It really is brilliant. HM: But there are huge holes! Can’t folks just cross somewhere else? SP: Well, I admit, the plan is not perfect, but you don’t have to be so negative. HM: Well…I’m sorry….but the plan seems fairly…well…misconceived. How on earth will it curb illegal immigration by 50%? SP: Well it covers half of the border doesn’t it? That means Obama has solved half of the problem. That’s more than George Bush did by the way…. HM: (Clearing throat) Well..back to the issue of Arizona, isn’t putting them on the Axis of Evil list just a bunch of political hype? I mean, what can Obama really do? SP: He is ruling nothing out. Except nukes that is. SP: Oh he is serious. Even if Arizona uses biological weapons against its poor immigrant population, Obama won’t nuke them. SP: I know, it does seem like we are tying our hands a bit. The good news is, he is really fond of Predator Drone strikes. At this point, our interview concluded as our source said something about being late for a Phoenix targeting party and dashed out of the door. Rest assured however, that Head Muscle Press will continue to monitor the developing situation in Arizona. Whatever happens, it is clear that Obama (aka. El Guapo) is standing firmly against their attempts to uphold the law. In the meantime, if you happen to live in Phoenix….watch the skies. Once upon a time there was a town in the American southwest called Phoenix. For a while, it was a decent place to live, but there was a problem growing there. Because the government was unable, unwilling, inept, or all of the above, immigration law in America and the lack of enforcement created an easy place for people who came to the county illegally to settle in. Needless to say, lawlessness begets lawlessness. However, the outlaws had support from within the country. Between the lawlessness of the illegals and of the politicians who would seek to pander to these lawbreakers for position and power, some law abiding people were inclined to move elsewhere. For those who vowed to stay, for those who stood for the law of the land, for those who would stand against lawbreakers: threats of violence and acts of violence were visited upon them. Nonetheless, a new law was passed. It said that breaking the law was now officially against the law. Amazingly, this seemed to work, as the lawbreakers decided to move on to towns where breaking the law wasn’t against the law. 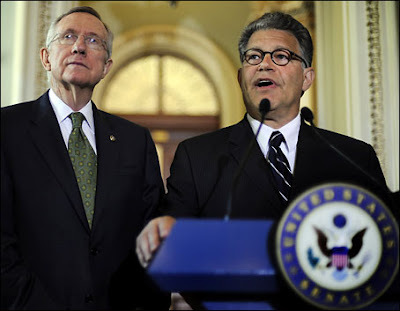 Back in Washington, this news was not good for democrats in power. They gathered to discuss the deep ramifications of Arizona effectively operating without their approval or assistance. Call me jaded, but it seems to me that democrats might really be upset over this law because it does what none of their legislation can ever hope to accomplish: actually work. Folks at the scene noted that, after Obama’s 9th or 10th pass through the speech, most of the press corps caught on to what was happening and headed out for lattes. Correspondents from MSNBC stayed behind however, feverishly taking page after page of notes. “I have never seen people write so fast,” our source mused. “They were going through one mechanical pencil after another, dropping them all over the floor each time they stood to applaud Obama’s comments. After a while, it looked like some crazy aerobics class full of over-dressed morons. It was really getting dangerous.” In an effort to put an end to the crisis, Rahm Emanuel placed a call to the White House electricians to shut power down to the entire building, but unfortunately their new union contract had given them Thursday through Sunday off. HM: So, is the President still stuck in the teleprompter loop? HM: Why not just cut the power cord leading to the prompters? Source: We thought about doing that, but the President’s physician believes that such an abrupt shut down could damage the President’s autonomic nervous system. HM: How do they know this? Source: Well, it wasn’t really publicized, but a few years ago we had a similar problem with another person. 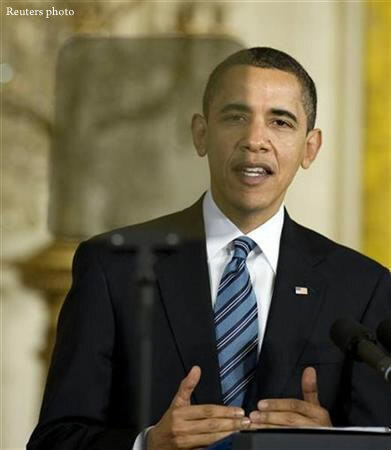 He needed the teleprompter even more than Obama, and when we turned it off, it pretty much turned him into a vegetable. HM: Wow, that is horrible! How is he now? HM: Oh, I see… so what is the plan for getting Obama unstuck? Source: Well, the plan is to slowly bring him down before we break the connection. HM: How will you do that? Source: First, we network in a new computer with the speech on it, and then we switch the prompter signal over. Once we have done that, we will gradually begin slowing the speed of the speech down until we get it to normal. Source: Well then we simply start eliminating paragraphs and sentences until we have him down to repeating just a few words over and over. Something like, “me like Russia….me like Russia…me Russia…” Then we will slowly take him down to nothing but the letter “r.” Once we have him comfortably r-ing for 10 or 15 minutes, we will stop the prompter and hopefully save most his higher mental functions. HM: That sounds like a daring plan, what happens if it doesn’t work? Source: Oh, we have a contingency plan for that as well. If we cannot break him away from the prompter safely, our plan is just to keep him there. Source: Well, it is really pretty ingenious. You see, Obama has already held more interviews and press conferences in his first year than the last two administrations combined. Hell, you can hardly turn on your television without seeing him talking about…something. So our plan is to just change his clothes, feed him new speeches, and keep him going. When we need him, we will just turn the cameras on! No one will be able to tell that it isn’t business a usual….it ingenious! HM: What about Michelle and the kids? Source: Oh they will be able to come in and see him on weekends. We will put some fatherly statements on the prompter like, “Hey girls let’s get a burger,” and “How’s the garden honey?” We will do our best to make him lifelike. HM: I see. Well it certainly is a daring plan. Source: Yep, our only real concern is ensuring the Republicans do not hack into the system. HM: Is that a threat? Source: Well last week when health care passed, Biden was just supposed to hug Obama and say, “This is a big deal.” We even put it on the prompter to ensure he did not mess it up. After the speech, we looked at the computer and someone had spliced the F-bomb in! HM: Wow, that is pretty devious. Who do you think did it? Source: Well we are not sure, but we have heard rumors that Sarah Palin has build a huge satellite-based super computer network and is trying to control Obama’s teleprompters from space. We are thinking that she has been working out the kinks on Biden since the election. I mean, it could be a real problem! HM: What would she do? Source: We could loose control of the President! What if she made him say something nice about insurance companies? Maybe she would have him admit that the free market is the most powerful economic force on earth! What if she just had him make animal noises? It could be a real disaster! We cannot let it happen. HM: What about Helen Thomas – is she OK? Source: Oh Helen? She’s fine, the Bush staffers used to pull her O2 all the time just for fun. She’s a trooper... Well I have to get back into the press room, it is time for the President’s chap stick. If I don’t apply it every fifteen minutes his mouth starts smoking. I would like to start out by apologizing to all my loyal Head Muscle readers for what you are about to see. I have made it a top priority at HM to try to provide my readers with the highest quality work and ensure that all posts are relevant, well reasoned, and at least somewhat thought provoking. This post is the clear exception however. A good friend of mine, Tracey, took this photo at a local DC McDonald’s a couple of weeks ago and sent it to me. It is simply too funny not to share. So, thanks Tracey for helping me develop the first HM post completely devoid of any meaningful content. Is it a new type of Happy Meal? Does it come super sized? 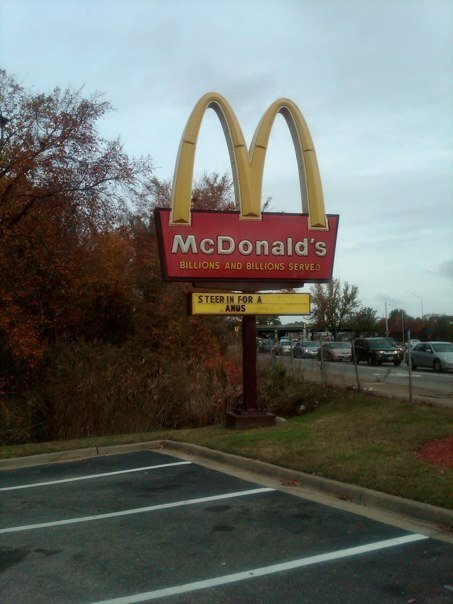 Did McDonald’s take TARP funds? Can I just get an apple pie instead? Maybe I am just reading too much into it…by the way…what is in those hamburgers?